This photo shows the airplane departing Frankfurt. 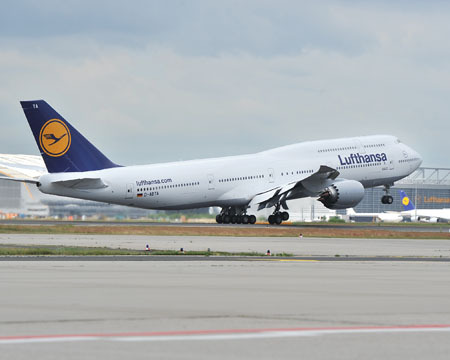 EAST MEADOW, N.Y., June 1, 2012 /PRNewswire/ -- Today Lufthansa, launch customer for the Boeing (NYSE: BA) 747-8 Intercontinental, initiated commercial service of the new Jumbo jet along the inaugural route of Frankfurt (FRA) to Washington, D.C.'s Dulles International Airport (IAD). Flight LH416 departed Frankfurt at 9:50am and is scheduled to touchdown at Dulles at 12:45pm. In addition to regularly scheduled passengers, guests include Dr. Christoph Franz, Lufthansa's CEO and Chairman of the Executive Board, and Elizabeth Lund, Boeing vice president and general manager, 747 Program, who are joined by a delegation consisting of U.S. and International media, esteemed customers and partners. The return flight, LH419, is scheduled to depart Washington, D.C. this evening at 5:55pm, arriving in Frankfurt at 8:05am the following day. Lufthansa's newest flagship aircraft will provide service between the two cities initially six days a week (excluding Tuesdays), and will increase capacity on this route by 6.3 percent. Flights are available for booking on www.lufthansa.com. "The Boeing 747-8 Intercontinental is an exceptional aircraft," said Christoph Franz, Chairman and CEO of Deutsche Lufthansa AG. "With its addition to our fleet, Lufthansa has created a product that is not only in line with our company's commitment to innovation, technology and efficiency, but that also offers qualities and features that are sure to maximize our passengers' in-flight experience. Travelers to and from Washington, D.C. are in for a memorable flight and Lufthansa looks forward to expanding our 747-8 Intercontinental service to other U.S. markets in the coming months." "It is such an honor to join Lufthansa in welcoming the 747-8 Intercontinental into service," said Elizabeth Lund, Boeing vice president and general manager, 747 Program. "Lufthansa has provided great inspiration and leadership in helping us design a new Queen of the Skies for the 21st Century, an airplane that Lufthansa will love for its efficiency and reliability, airport neighbors will love for its quiet operations and low emissions, and passengers will love for its beautiful new interior and extra space." "We want to thank Lufthansa for selecting Washington Dulles International Airport for the honor of receiving the very first commercial flight of a Boeing 747-8 Intercontinental anywhere in the world," said John E. Potter, President and CEO of the Metropolitan Washington Airports Authority. "As the international gateway to our nation's capital, Dulles has been honored to remain on the cutting edge of new aircraft technology since its opening 50 years ago. We congratulate Lufthansa on the debut of this impressive new aircraft and thank them for serving Dulles as the launch market from their Frankfurt hub." Upon the flight's arrival, Lufthansa, Boeing and the Metro Washington Airport Authority will host a press conference, along with guest speaker Francisco J. Sanchez, Under Secretary of Commerce for International Trade. Lufthansa's 747-8 Intercontinental is equipped with 362 seats in a three-class configuration (8 First Class, 92 Business Class and 262 Economy Class). Passengers flying on the 747-8 Intercontinental will experience Lufthansa's new Business Class which offers a unique seating arrangement in the form of a "V" whereby two neighboring seats are angled towards one another along a central axis. This innovative solution enables Lufthansa to fulfill one of the main wishes expressed by customers during an extensive research process – to sit or lie facing the direction of travel, while at the same time enjoy virtually double the distance between two neighboring seats at shoulder level, which now gives Business Class passengers greater privacy and more personal living space. At the push of a button, the seat converts to a full-flat, horizontal sleeping surface measuring 6'6" in length (1.98 m). Ergonomically improved cushioning ensures a high degree of comfort in a sitting or horizontal position, and adjustable armrests provide more space in the shoulder area when lying down. The Boeing 747-8 Intercontinental features new, state-of-the-art wings with improved aerodynamics and raked wing tips; new fuel-efficient, U.S.-manufactured GEnx-2B engines that contribute to a reduction in fuel burn, emissions and noise and thus give customers the lowest operating costs and best economics of any large passenger airplane; and fly-by-wire technology. Lufthansa's commitment to the Boeing 747-8 Intercontinental is a testament to the airline's 50-plus year partnership with the U.S.-based manufacturer. Lufthansa currently has 20 Boeing 747-8 Intercontinentals on order and is expected to take delivery of five in total this year. The airline will roll-out service to gateways throughout the U.S. and India. The aircraft generates a 30 percent smaller noise footprint than the 747-400 and brings double-digit improvements in fuel efficiency and CO2 emissions per passenger, making it one of the industry's most fuel-efficient aircraft and key to Lufthansa's commitment to sustainable reduction of carbon dioxide emissions. The 747-8 Intercontinental fuselage is 250'2" long, which is 18'4" longer than the 747-400. The stretch also provides Lufthansa with 26 percent more cargo volume. The public can track the progression of the 747-8 Intercontinental into Lufthansa's service via a dedicated 747-8 Intercontinental micro site (www.lufthansa.com/747-8) that showcases product features along with 3-D models of the aircraft and interactive games. One of the world's largest and most prestigious airlines, Lufthansa currently flies to 211 destinations in 84 countries, with hubs in Frankfurt, Munich, and with the Lufthansa Group acquisition of Austrian Airlines, Brussels Airlines and SWISS - Vienna, Brussels and Zurich. From its 21 North American gateways, Lufthansa— recently voted by Fortune as one of the five most admired airlines in the world— and its partners serve over 450 destinations in more than 120 countries. An industry innovator, Lufthansa has long been committed to environmental care and sustainability, operating the most technologically-advanced and fuel-efficient fleet in the world. Its long-haul fleet to and from North America includes the Boeing 747-400, as well as the Airbus A300 sub fleet. Currently, Lufthansa has over 160 new aircraft worth about $22 billion on order. Lufthansa is the largest European operator of the A380 and is also the launch customer for the new Boeing 747-8, the industries' two most fuel-efficient passenger aircraft. Known for its premium services, Lufthansa continues its $105 million program earmarked for building new or upgrading existing lounge facilities across its worldwide network and will spend more than $3.6 billion in new onboard products and services by 2015. In 2010, Lufthansa re-launched its broadband wireless Internet service onboard, FlyNet. For more information or reservations, visit www.lufthansa.com.